The exuberant dog who first appeared in If You Give a Pig a Party now stars in his very own book in the beloved #1 New York Times bestselling If You Give... series! If you give a dog a donut, he’ll ask for some apple juice to go with it. When you give him the juice, he’ll drink it all up. Then, before you can say “Woof” . . . Dog is off on a backyard adventure! 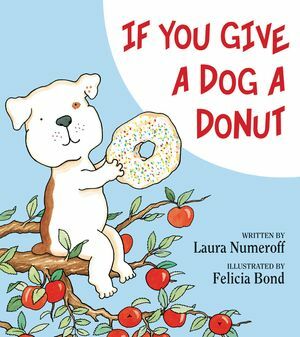 If You Give a Dog a Donut is another home run from the beloved team of Laura Numeroff and Felicia Bond. Make the Match with Dog! Get the latest sneak peeks, special offers, and more from HarperCollins Children's Books! Thank you for signing up to receive news about Mouse Cookie.